Sounds pretty standard, right? Well, there are several game mechanics that make 7 Wonders very different to other games. In the first turn of an era, each player is dealt 7 cards from the current era deck. After building/discarding a card, the players pass their hand to the player on their right in the 1st and 3rd eras, and the player on their left in the 2nd era. This continues until all players have one card remaining which is discarded. This is the main, unusual game mechanic in 7 Wonders and it works really well. The passing of cards means you need to think on your feet as you don’t know exactly which cards you will get to choose from next; sometimes you need to adjust your strategy based on what cards you have, but other times you may choose to hold out and hope you get the cards you would prefer. Rather than each player playing a solo game, you interact with your direct neighbours in several ways. You can buy resources from them (which can’t be refused). Also, some VP scoring cards are based on your neighbours’ cards. Plus, at the end of each era, you compare your fighting strength against your neighbours’ (scoring -1VP if you are weaker and, depending upon the era, +1/+3/+5 VPs if you are stronger). So, you need to keep an eye on them. Selecting a card from your hand affects any player who receives that hand afterwards but your neighbours are the ones who you look to affect the most, especially when you see a card that could be built for free, earn them lots of VPs, or give them military strength. So, you may want to use a card in order to deny them something that could help them a lot, but you need to weigh it against what effect using that card will have on you. The card passing game mechanic makes 7 Wonders a fast game as each player takes their turns simultaneously. The game plays 3 to 7 players so with fewer players you will see some of the cards you start an era with again, i.e. with 3 players you’ll see the 3 hands twice each. It’s important to be strict and co-ordinated so everyone takes actions at the same time because it is easy to get confuse if some players play faster than others and the different hands of cards get out of sync. The buildings are very varied and come in 7 types – some produce resources for building with, some give military strength, some earn points (some are fixed but some are variable based on your, or your neighbours’, buildings). The building cards are colourful, look great and the icons work well. Also, the information on cards that allow further free building is well-designed as they not only state which building they will allow the player to build for free but also show what benefit that free card will give. This is really helpful because you don’t need to memorise what the other cards are to know if you would want that free building in future. The variety in the game should be great for replayability. There are lots of different cards but the Wonders are all different too with each one’s 3 stages giving (and costing) different resources and having different abilities. Also, the Wonders are double-sided with slight differences – the rules say the B-sides are slightly more complicated but still balanced so can be played against A-sides. As the eras increase, the building costs increase as do the benefits, so the game has a good sense of progression. At the end of the game, 7 different elements are scored. None of the scoring mechanics are complicated and many VPs are shown on the cards; however, the multiple scoring methods can be a bit confusing for new players. Also, as almost all VPs are calculated at the end of the game, it makes it hard to work out who is winning during the game which I don’t mind but some players may not like that. The rules for VPs earned and lost through military conflict are clever because they really ensure players interact with their neighbours. As soon as one starts building military strength it is easy for a cold war to ensue which neither player wants to lose as they both want some benefit from using turns building their military. I think that, even with lots of variety in the cards, 7 Wonders is a relatively simple game and that’s one of its charms. However, be warned that I think it is quite challenging for light or new gamers on their first couple of plays. I played it twice with a lighter group and players were a bit overwhelmed by the meaning of icons, variety of buildings and scoring opportunities, especially with the card passing mechanic. It’s nothing that a few plays won’t solve but it’s easy to overlook these complexities when you’re an experienced gamer. For experienced gamers, it will take a couple of plays to understand what cards are available and, therefore, what strategies are possible. Also, if possible, avoid placing a very experienced player next to a very inexperienced player because the experienced player will have an advantage and the inexperienced player a disadvantage. 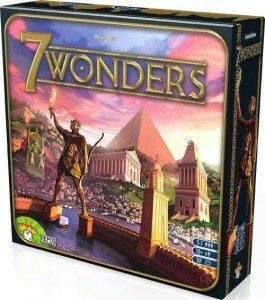 Overall, I really like 7 Wonders because it’s fresh, has variety, feels different to other games and, above all, is fun. With so few actions in the whole game, I feel that every action and decision counts yet, as it’s a short game, I don’t mind experimenting and don’t take it too seriously. Also, I like that there are different building strategies to follow (such as focusing on the buildings that deliver free buildings) but you do need to create a strategy as you play because building randomly won’t score the big points. I haven’t played with 3 or 4 players yet and I think playing with 3 will be even more interesting because the cards circulate more. In the end, it’s nice to see a game with such pre-launch buzz deliver on the expectations. This entry was posted on Monday, January 24th, 2011 at 10:06 am	and is filed under 7 Wonders, Board Game Review, Board Games, Essen Spiel 10. You can follow any responses to this entry through the RSS 2.0 feed. You can leave a response, or trackback from your own site.